The Valley of the Sun is what we locals call the Phoenix metro area. It includes Phoenix, Scottsdale, Mesa, Tempe, Glendale, Fountain Hills, Carefree, Cave Creek, Chandler and several others. Here’s the inside scoop on Tempe, Chandler and Mesa. If a college-town atmosphere is what you want for your stay, then Tempe is the place for you. Tempe is home to Arizona State University and major outdoor attraction Tempe Town Lake. Truth be told, Tempe is the place to be if you are into Iron Man competitions, marathons and festivals. But it’s also home to ASU Karsten, Ken McDonald, Shalimar, Rolling Hills, Pepperwood and Rio Salado golf courses. It’s also very close to Papago Golf Club. Excluding ASU Karsten and Papago, golf in Tempe is all about local, low cost golf. The City has more than 30 rooming options, most of which are limited service chain hotels, which do a great job. The Sheraton Mission Palms is more up-scale and located right in the heart of downtown Tempe. 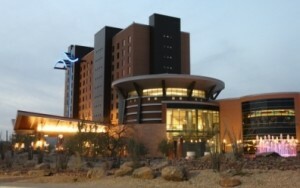 For a resort experience, check out The Buttes, a Marriott property located about 10 minutes from downtown. We call this section Chandler, but it really encompasses Chandler, Gilbert and Maricopa and a host of golf and hotel choices. Sheraton Wildhorse Pass, a full service resort and casino, is our recommended home-base for southeast Valley golf. It is a full-service property and features the two Whirlwind golf courses on property. The resort is just a short drive away from Southern Dunes and Ocotillo, two great options and very different experiences. The San Marcos hotel, built in 1912, is home to one of the oldest 18-hole facilities in the State. A totally different experience from Wildhorse Pass, this quaint, historic property is located in the heart of old-town Chandler. Not looking for a resort in Chandler? No worries, there is a plethora of smaller chain hotels located all around the City, providing easy access of Bear Creek, Lone Tree, Springfield and Ironwood golf courses. Mesa boasts over 60 hotels/motels and RV parks, many of which fall under the Comfort Inn, Best Western, Ramada and Courtyard flags. They provide a clean and comfortable place to rest after your round and will put you in the heart of what we call Wrigley West – the Chicago Cubs spring training stadium. The premiere facility in Mesa is Arizona Golf Resort, featuring an 18-hole track on property. Just down the road a piece, you’ll find Gold Canyon Ranch, a full service resort, nestled at the base of the Superstition Mountains. The resort offers a range of accommodations including villas, casitas and suites. Once you arrive, you really don’t have to leave as the resort has everything you’ll need on site, including the Dinosaur and Sidewinder golf courses, full spa, restaurants and first-rate service. Plan to stay in Mesa if your choice for golf includes Superstition Mountain, Superstition Springs, Augusta Ranch, LongBow, Las Sendas, Mountain Brook and Dobson Ranch. Your drive won’t be longer than 15-20 minutes to any of these options.